Four become one: A shake up of Sneinton centres? 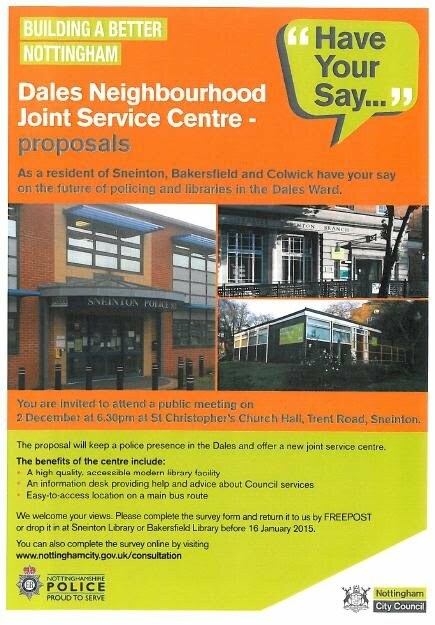 A public meeting on December 2nd unveiled plans to close and sell Sneinton & Bakersfield library buildings and the SureStart centre on the Dale- and replace them with a single 'joint service centre' at the Sneinton Police Station. We've been wondering for a while about the future of the various community and centres and services around Sneinton in the face of budget cuts at the Council. We also held a public meeting to consider the future of the centres and have been wondering about the future of Local Libraries since Bakersfield library was threatened with closure recently. Now the Council has hatched a plan to keep the Police Station going by converting it into a "Joint Service Centre", featuring a new library on the ground floor with the Police local beat team housed on the top floor. The Councillors would hold their surgeries in the building along with other sessions currently delivered through the Libraries. The conversion work to the Police Station would be funded with a £500,ooo investment by the Council and £350,000 raised through the sale of the Sneinton Library building, the Bakersfield Library site and the small SureStart Centre next to the Coop on Sneinton Dale. most people welcomed the Police presence remaining on the Dale and thought it was good to keep the Police Station as a Civic building. It was hoped that placing a new library on the Dale will increase the footfall of Library users overall, and this will bring other benefits to that area of the Dale. Current users of Sneinton Library including the elderly residents of Carlton Fold and the young people who use the computers after school will find it more difficult to access the Joint Service Centre. Some people may refuse to go into what they see as a police building at all, making it more difficult for them to access services. The Bakersfield Library is one of the few remaining services in the area- residents felt they were being abandoned. The Sneinton Library is a beautiful public building- can a suitable use be found for it to serve the local community?